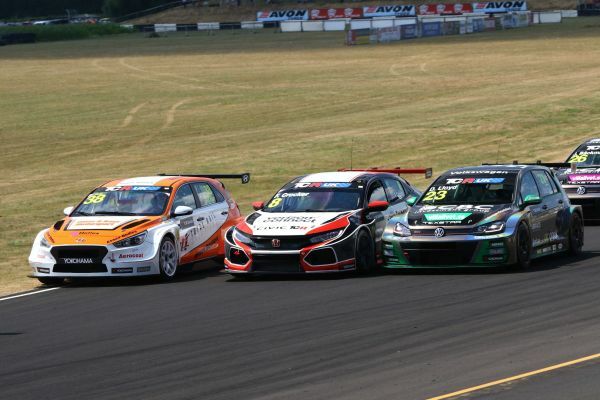 The TCR UK resumes this week at Oulton Park for rounds 9 and 10, three weeks after Oliver Taylor became the first driver able to beat Daniel Lloyd. Taylor drove his Pyro Motorsport Honda Civic to finish second behind Lloyd's Volkswagen Golf GTI in Race 1 at Castle Combe, but then inherited the victory when Lloyd was penalised and demoted to second for unfair driving. In fact he had stoled the lead from Taylor - who had led for the whole race - by pushing him wide on the final lap. Lloyd was also given a 15-point penalty. The WestCoast Racing driver took his revenge in Race 2, scoring his seventh victory of the season and retained an 82-point leading margin over Taylor in the standings. However, Taylor's victory showed that he is not unbeatable. At Oulton Park the series welcomes Tim Docker who will be driving a Volkswagen Golf GTI run by Maximum Motorsport. The team will expand to three cars, adding Docker's Golf to Carl Swift's and Stewart Lines' Cupra cars. Lines claimed Maximum Motorsport's best result so far in the season with a third place in Castle Combe's Race 2. The latest addition to the grid was Ash Sutton, the reigning BTCC champion, who will replace Finlay Crocker in the Honda Civic FK7 run by Verizon Connect Racing. Increased business commitments looked as though they would force Crocker to miss the event, but the Scot offered Sutton the opportunity to drive the car this weekend.